Perhaps the biggest downfall of owning a house – any house, even a small one – is that you are essentially rooted to one place for as long as you choose to live there. It’s what makes settling down with a mortgage so difficult. As human beings we constantly crave change, we lust for adventure, and sometimes it’s hard to imagine ourselves in the same place forever. Enter tiny house trailers. Tiny house trailers are small enough and light enough to pull behind a truck while you travel from place to place, but big enough that you can comfortably live in them while on the road or once you’ve reached your destination. It’s the perfect solution to your home-owner concerns – you can have a place of your own, while also remaining rootless and free. Since 2011, Leaf House Small Space Design and Build has specialized in designing and building tiny houses with a focus on combining modern design with eco-friendly materials. Based in Yukon, Canada, each tiny house is built to withstand extreme climates, including harsh Canadian winters. Because of the time and care that go into each tiny home, Leaf House only builds a couple houses per year, which means that if you’re interested in purchasing one, you may want to get on the waiting list sooner than later. If you prefer to do the building yourself, you can also purchase the plans from their website for $150. The Version 2 model features an innovative loft that allows the owner to stand up beside the bed, radiant electric heaters, a glowing entrance light cover, Sun-mar composting toilet, skylight, full size range, a compact bathtub/shower, and a vented propane tankless water heater. 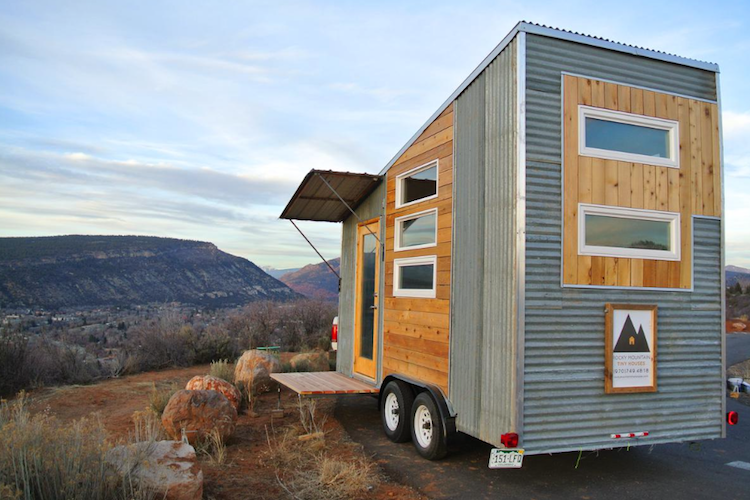 Tumbleweed Tiny House Company is the largest manufacturer of tiny house RVs in North America. Because of this they have plenty of options for those looking to buy, including different sizes, designs and features. The Cypress is Tumbleweed’s most popular model. The 20 ft. trailer is 188 sq. ft, and sleeps up to 3 people. You can rent this tiny house for $399 a month. Buy or rent this tiny house trailer here. A family run business, Tiny Heirloom sets out to bridge the gap so that downsizing doesn’t mean downgrading. Each tiny home is custom made completely from a blank slate, which means that you get to choose every last detail of your home and they will take care of making it a reality. The houses are also made to easily incorporate a solar set up so that you can power your tiny house using clean energy. The Tiny Adventure Home was created for a Mississippi couple who has a passion for travel and adventure. They even had the exterior of the tiny house made to resemble a rock climbing wall, proving that for this company the sky’s the limit. Born in April 2013, Rocky Mountain Tiny Houses also places an emphasis on customization. Every house is built from scratch and created especially for those who have a love of nature. The Boulder Tiny House is the model that launched the company and has since gone on to be the inspiration for numerous other models. This model is designed with a 120v AC plug in, water hose connection, and drain pipe to be connected to a RV/mobile home sewer system. However there are also off-grid options available. The design was created to be both affordable and easy to tow. Located in DeLand, Florida, Tiny Home Builders was founded in 2009. Besides selling finished tiny houses, the company also sells plans so that others can build their tiny houses themselves. They also offer custom tiny homes. Tiny Home Builders gives back to the community by donating 2 per cent of their profits and at least 1 per cent of their time to charitable organizations. The most popular tiny house design, Tiny Living has a large family room with vaulted ceilings, a bathroom and a kitchen. Above the kitchen sits a 7-foot sleeping loft. Buy the house or buy the plans here.